Slow cooker refried beans are cooked on low in the slow cooker for 8 hours. 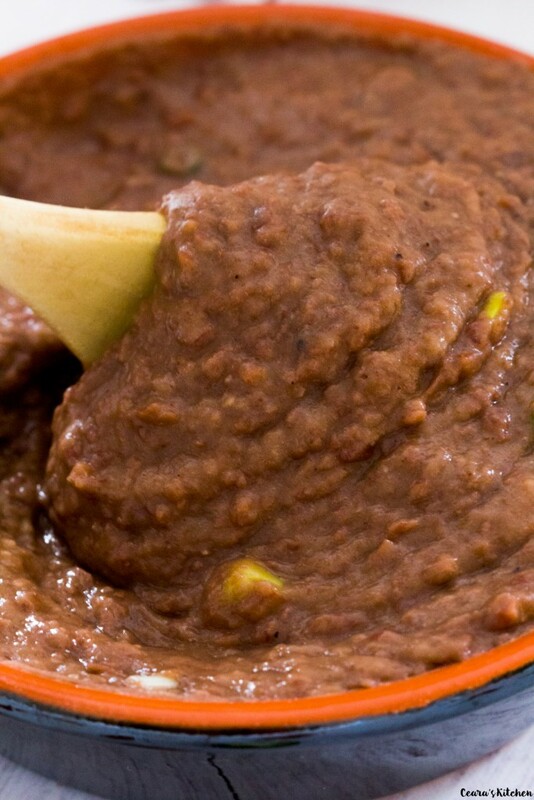 The results are creamy, easy and incredibly flavorful refried beans without any oil or frying. I am in looove with my new slow cooker guys. Do you use a slow cooker? J and I recently moved into our new apartment and since we moved from Belgium before then, we have had to buy all new appliances in our new place. 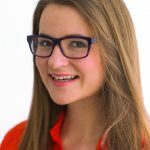 I’ve been going appliance crazy – I have pretty much all of my essentials now but still have my eyes on a couple others (I’m looking at you bread maker, lol). One of the best appliances I’ve been without a doubt getting my money’s worth out of is my new slow cooker. I work from 9 to 5, so have been loving using my slow cooker during the busy work week. I toss the ingredients into the slow cooker in the morning and come home to a delicious slow-cooked meal after work. I’m working on some fun One Pot Slow Cooker meals to share with you guys soon! 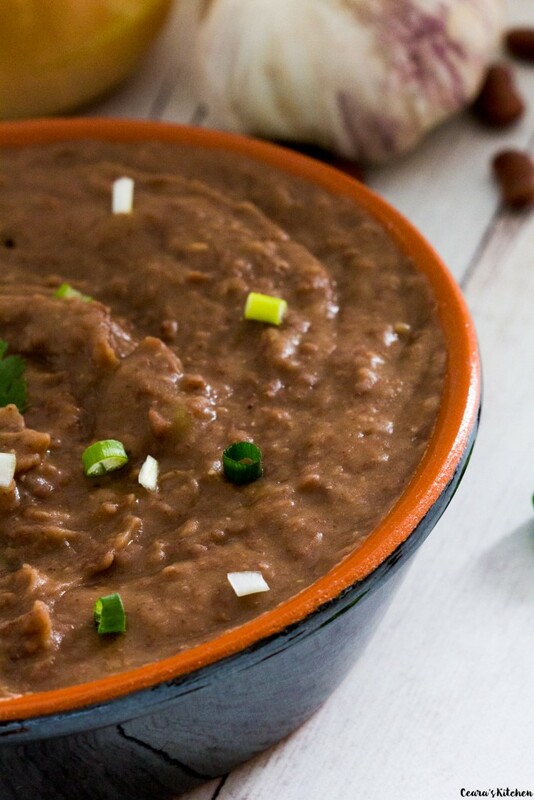 These No Fry Slow Cooker Refried Beans are something else guys! 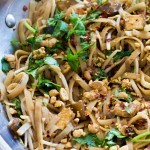 They are super tasty, healthy (with absolutely no added oil) and take about 10 minutes of “hands-on” work altogether. Toss all your ingredients in the slow cooker. And leave to cook on low for eight hours. You’ll have a bit of leftover water to scoop off the top at the end which doubles as a bowl (or two!) of soup. Toss some chopped guacamole, a couple tortilla chips into the extra liquid for easy-peasy slow-cooked bean soup. Yum! Mash the Slow Cooker Refried Beans (or blend the beans with an immersion blender if you like your refried beans super creamy like me). Serve with ALL your fave Mexican food or as a warm dip. If you guys do make these Slow Cooker Refried Beans at home, leave your feedback below and snap a photo, tagging me #CearasKitchen on Instagram. Ohh and I recently joined the world of Snapchat – add me as CearasKitchen to see the behind the scenes in my kitchen! Slow cooker refried beans are cooked low in the slow cooker for 8 hours. The results are creamy, easy and flavorful refried beans without any oil or frying! Rinse the dried (i.e. not canned) kidney beans. Add the kidney beans to the slow cooker. Blend (or grate finely) the white onion and garlic. Add the blended garlic, white onions, spices, bouillon, bay leaves and water to the crock pot. 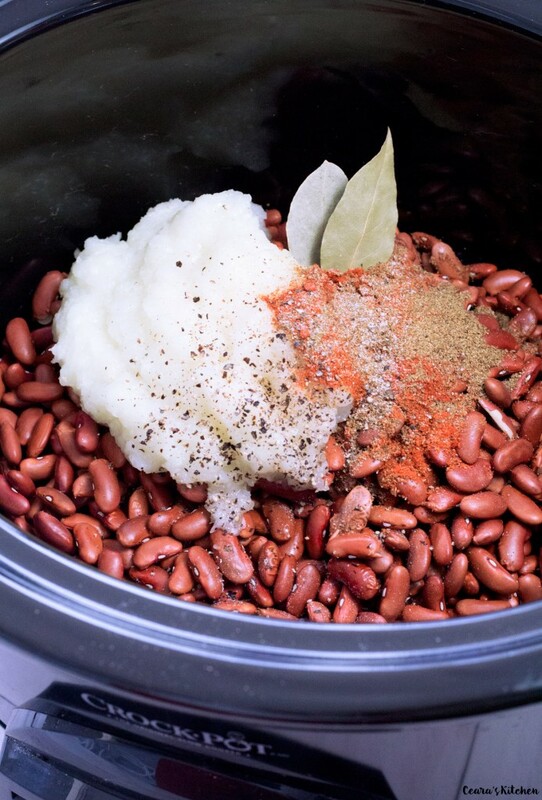 Turn the crock pot on low for 8 hours until the beans are soft. You will have a bit of water leftover at the end of the cooking time, scoop the extra water out of the crock pot. Do not throw out this water (see note! ).The amount of water you scoop out will depend on how thick/chunky you like your refried beans. Remove the bay leaves from the pot. Blend the beans with an immersion blender or with a potato masher until creamy. Taste test and add extra salt, pepper, cayenne and cumin to taste. Serve warm with your favorite Mexican dish or as a warm dip with chips! The extra water after cooking makes a great bowl of soup with some cubed avocado and tortilla chips! 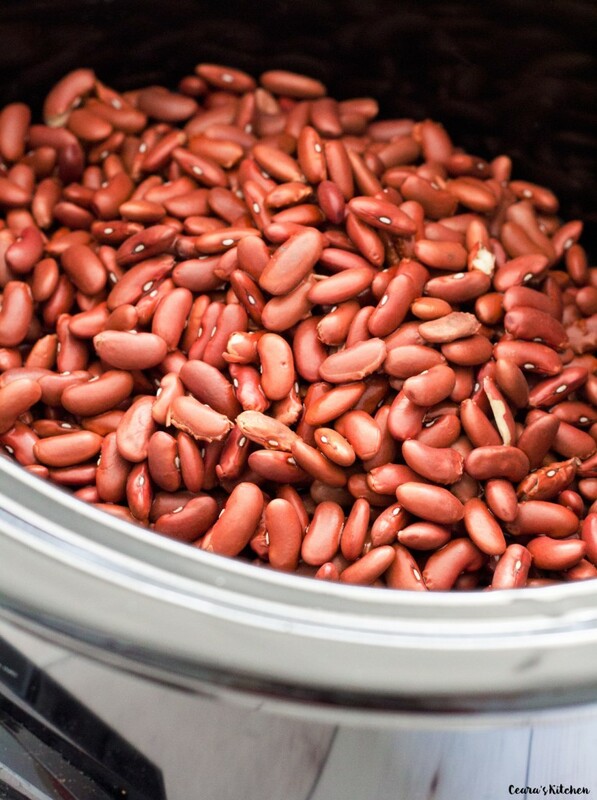 Kidney beans have to be boiled on the stovetop for 10 minutes before the slow cooker process. If you skip this step, you could have some unpleasant stomach issues. Can this be cooked on high for less time? I need to make this today! What can I use in place of the bouillon cube?